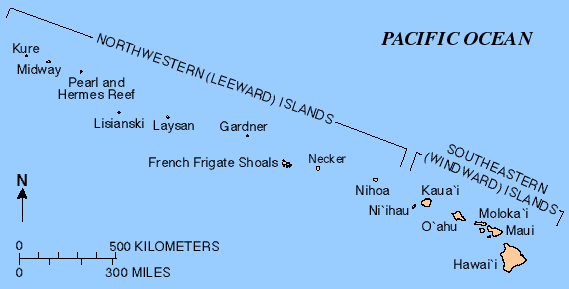 The “Hawaiian – Emperor seamount chain” is a vast undersea mountain range interspersed with islands, underwater mountains (seamounts), atolls (ring shaped coral reefs encircling a lagoon), shallows, banks, reefs and more than 80 volcanoes, that extending across the Pacific Ocean for 3,728 miles (60,000 kilometers) from the Hawaiian islands to Alaska and Siberia. 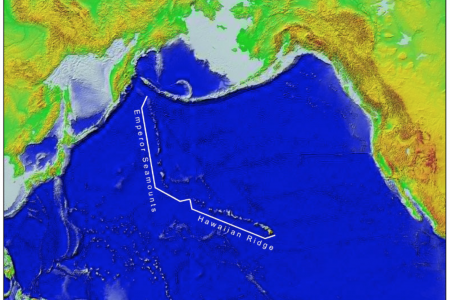 The chain has been forming during the last 70 to 80+ million years by volcano eruptions and movement of the ocean floor (the “Pacific Plate”) over a volcanic region known as the “Hawaii hotspot”. Closest to this hotspot is the Hawaiian archipelago (aka Windward islands) that includes eight main islands: Hawaii (aka ‘the Big Island’, the Island of Hawaii & Hawaii Island to distinguish it from the US state of Hawaii), Maui, Oahu, Kauai, Molokai, Lanai, Niihau, and Kahoolawe, a number of small islands, atolls, and seamounts, extending 1,500 miles (2,400 kilometers) from the Kure Atoll to the Big Island, the southernmost point of the Hawaiian – Emperor seamount chain. 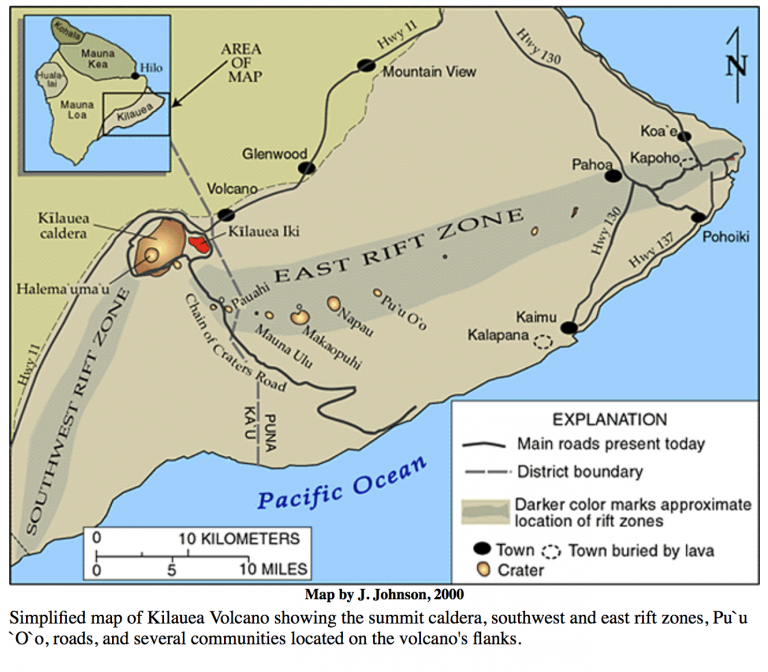 The formation of the Big Island is the result of sequential and simultaneous eruptions of five ‘shield’ volcanoes (low profile, circular, slopping shield shaped volcanoes) over a period of about 300,000 – 600,000 years, and at 93 miles (150 km) across and a land area of 4,028 sq. miles (10,430 km²), it’s the largest of the Hawaiian islands and still growing because of the lava flow from currently active volcanoes, Mauna Loa and Kīlauea. In accordance with beliefs and practices of the traditional Hawaiian religion, summits of the five Big Island volcanoes are revered by native Hawaiians as sacred mountains, and the powerful, passionate Fire Goddess, Pele, is believed to live within the Halema’uma’u crater located at the summit of Kīlauea. Pele’s domain, however, includes all volcanic activity on the Big Island, and she has the ability to cause lava to erupt from the ground at any time. She’s been a very busy goddess. The name ‘Kīlauea’ is translated to ‘spewing’ or ‘much spreading’, referring to frequent lava flows originating from the volcano. The name is well-deserved as there have been 61 separate eruptions from Kīlauea since 1823, making it one of the most active volcanoes on planet Earth. Most of these eruptions have been relatively moderate and have occurred within one of its ‘rift zones’ with lava flows moving downslope. [A rift zone is an area of ruptures on the surface that allows lava to erupt and flow from the flank of a volcano instead of its summit.] 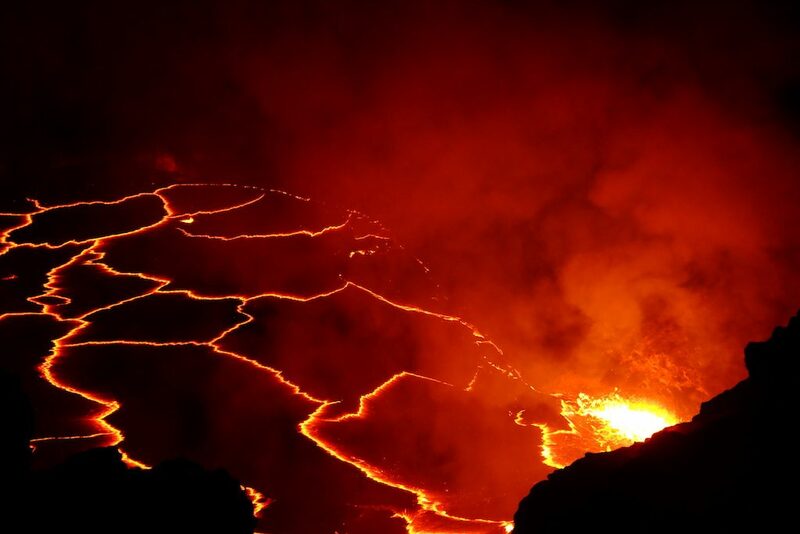 However, Pele does periodically create havoc with explosive and sometimes deadly eruptions that expel molten rock and gases across the landscape. Kīlauea’s most recent major eruption (dating back to January 3. 1983) is the longest period of volcanic activity in its documented history with lava flowing almost continuously for 35 years from the volcanic cone, Puʻu ʻŌʻō (‘high point on the skyline’) located within Kīlauea’s East Rift Zone. [Volcanic cones like Pu‘u ‘Ō‘ō are formed by the ejected magma rocks piling up around a vent.] The collapse of Pu‘u ‘Ō‘ō on April 30, 2018, resulted in the iconic eruption site and surrounding lava flow fields becoming devoid of lava during the rest of 2018. The absence of surface activity for such a long period of time makes it unlikely that lava activity will resume within Pu‘u ‘Ō‘ō; therefore, scientists have determined the eruption has concluded. It’s important, however, to remember that Kīlauea remains an active volcano that will erupt in the future, and hazards have not changed as a new eruption can quickly cause dangerous conditions. For status updates, check out the Report from USGS – Hawaiian Volcano Observatory (daily updates and warnings). In the video documentary 100 Days: 2018 Kilauea Eruption, photojournalist Andrew Richard Hara chronicles his emotional observations of the 2018 Kīlauea eruption. Also, see lava flow from Kīlauea up-close in HD. Two short videos, Dawn of Fire and River of Fire, (filmed and produced by Tyler Hulett) capture flowing molten lava as it moves toward the Pacific Ocean from Puʻu ʻŌʻō during daylight and night. It’s an incredible sight to see. The first western visitors to Kīlauea were two missionaries in 1823, William Ellis, an Englishman, and American, Asa Thurston, and after the building of hotels on its rim in the 1840’s, Kīlauea became a tourist attraction. Today, it’s protected within the Hawai’i Volcanoes National Park and visited by 2.6 million people annually. The park offers visitors dramatic volcanic landscapes of Kīlauea and Mauna Loa, archeological sites, historical places, and a look at rare flora, fauna and wildlife as well as hiking, biking, touring and camping. Popular stops are the Kilauea Visitor Center and the Thomas A. Jaggar Museum & observation deck. Scientific Study: In January 2017, a NASA-led science team began exploring Kīlauea and Mauna Loa from the air, ground and space to better understand volcanic processes and find ways to mitigate the hazards. US National Parks: There are more than 400 US national parks available to everyone, every day. 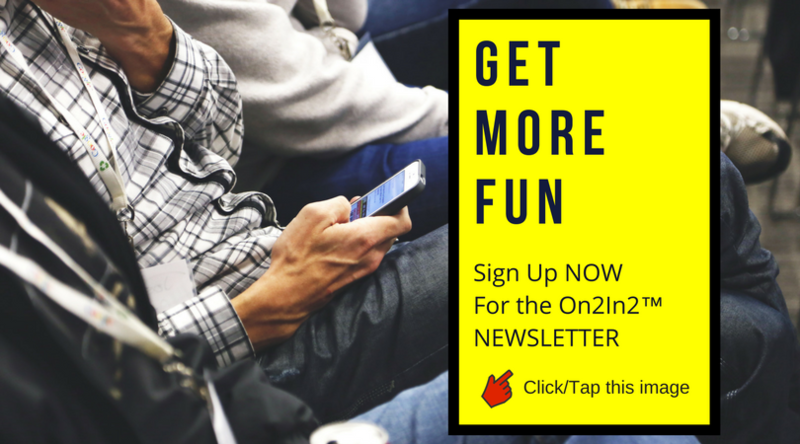 Most are free to enjoy, and the 117 that charge an entry fee (e.g., Hawai’i Volcanoes National Park) offer fee-free days throughout the year. 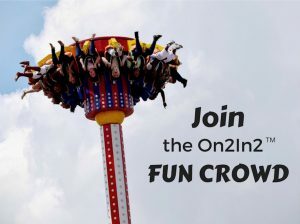 Find Your Park ← Use the search tools on this website to find the perfect place to visit.